This is a page of original comic book art from "Spawn" issue 169, page 13. The page is signed by series creator Todd McFarlane and Spawn artist Brian Haberlin. It comes with a certificate of authenticity for Todd McFarlane's signature (COA) from Midtown Comics, who ran the signing event I attended at New York Comic Con in 2010. The page measures 17" x 11". 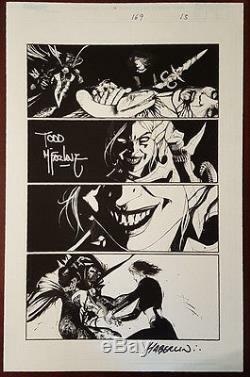 The item "Spawn Original Comic Book Art SIGNED by Todd McFarlane & Haberlin with COA" is in sale since Friday, July 21, 2017. This item is in the category "Collectibles\Comics\Original Comic Art\Interior Pages". The seller is "thebeckychick" and is located in Portland, Oregon. This item can be shipped worldwide.